We are proud to announce that Sr. Janis Haustein and 2 of her piano students will be participating in this wonderful event! 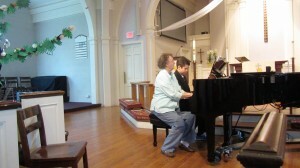 Glorious Grands: A Piano Extravaganza!! !is an eight Steinway grand piano and multimedia concert showcasing a variety of music for multiple pianos. One highlight of the event will be the World Premiere of “Astronaut Express”, a three-movement work for 16 pianists, including 8 dancing pianists, commissioned by the Salt Creek Music Teachers Association, with composer Tom Holmes, present at the concerts. Other featured pieces written for piano ensemble include favorites such as “April in Paris”, “Sabre Dance” and “Waltz” from Faust. Where else can you find 6000 fingers, 38 piano teachers, and the glorious sound of 88X8 piano keys? Fun for the entire family!